Do you ever shy away from buying pineapple because you just don’t want to cut it? That often was the case for us. We love pineapple for making salsa, grilling, and enjoying fresh. We like it too because it’s rich in bromelain, a protein enzyme, that has been proven in many studies to reduce pain and inflammation. Bromelain is also being studied as an alternative to chemotherapy in treating cancer. Regardless of the benefits of the bromelain in pineapple, we simple enjoy a lot more pineapple now that we use this slicer. 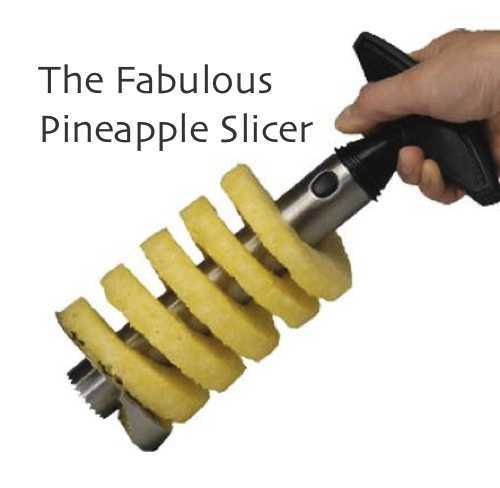 It peels, cores, and slices a pineapple in 30 seconds. We get perfect rings and core every time. By the way, did you know the core of the pineapple is edible? It is indeed edible, just slightly tougher than the rest of the pineapple. Also, it contains the greatest concentration of bromelain.